With seven years of volunteering and nearly 6,000 hours of service, USO of North Carolina volunteer Terry Grimes has no plans of slowing down. 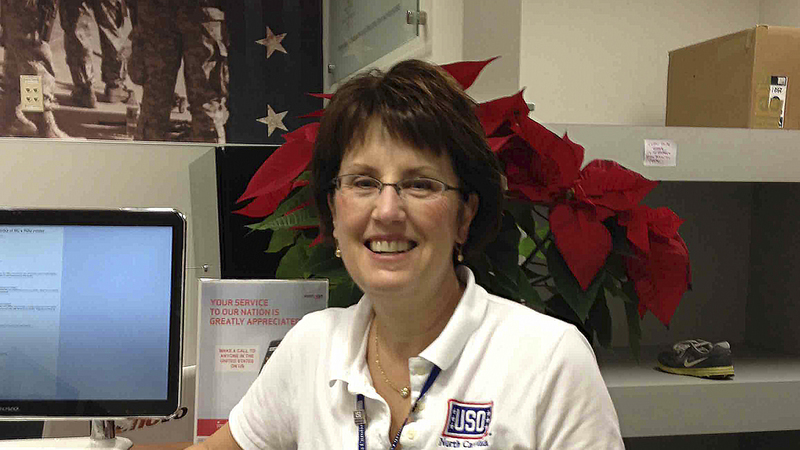 When she began volunteering at the USO center at Raleigh-Durham International Airport in 2007, Grimes recognized a need for a volunteer coordinator. So, she volunteered herself. Grimes ensures that 350 volunteers are screened, trained, scheduled and most importantly, happy. With the center open 24/7, She makes sure every shift has adequate volunteer coverage, even ushering new volunteers through the orientation and training process so they can successfully integrate. When she learned that volunteers wanted to do more, she established the USO Ambassador program at the Raleigh-Durham center. USO Ambassadors walk the airport terminals looking for military members to let them know where the center is. And if they don’t have time for a visit before their flight, the ambassadors provide them a snack and bottled water. Grimes’ commitment to excellence and efficiency is evident in her latest project—assisting volunteers as they begin using a new online volunteer portal that lets them sign up for events and log their hours. Her contributions have had lasting impacts beyond her center. She is an asset to the USO of North Carolina, which hopes to keep her busy for at least another seven years.